The school year is almost over and the sun is out; spring is heating up and summer is on its way. That means it's time to talk skin! Skincare is near and dear to my heart, mostly 'cause it's my largest organ and I can't get away from it. Ha. But really, I have sensitive skin and I'm fair, so I've seen my fair share of weird reactions and sunburns. I also have a confession to make: I sweat. Yeah, yeah, we all sweat... right? Except no, we all don't -- not really. I sweat. I know there are other 'change your deodorant each stick and pray to the perspiration gods before important events' ladies out there who feel me on this one. Thanks a lot for those fabulous genes, Dad! 1. Hydrate. Drink a lot of water! We all hear this constantly, but it really does make a big difference in your overall health, skin included. So load up and drink up for a healthy glow. 2. Moisturize. If you live in a hot and humid climate then definitely opt for a lighter summer formulation, something oil-free and not greasy... but make sure you're still applying plenty of moisturizer to your face and body to keep it healthy and looking great. 3. Apply plenty of sunscreen. This is crazy important and another thing that most of us are familiar with and could probably do a little bit better at. Make sure you're using a facial moisturizer with sunscreen and don't forget about your other bits and pieces too -- you don't want the face of a 30 year old with the décolletage of a 70 year old -- not attractive. If you're frighteningly pale like moi then use a gradual tanning lotion for your legs so as to not scare the neighborhood kids and pets. 4. Stay dry. Deodorant is pretty much my best friend in the heat (see embarrassing confession in first paragraph). 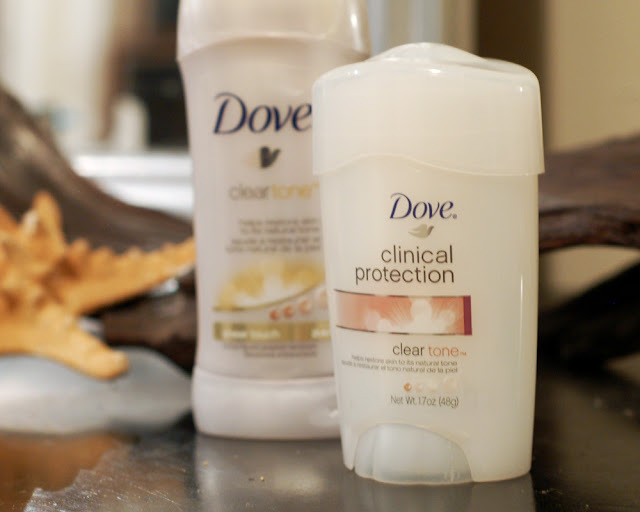 Dove Clear Tone Deodorant is available in both regular and clinical strengths that both do a great job at both keeping you dry and moisturizing your skin. Dove Clear Tone Deodorant also helps reduce dark marks in your underarm from shaving to help you feel even more confident when baring skin in sleeveless summer styles. I am a big fan of the clinical strength, what with my overactive sweat glands! And I have to say that I love how it kept me dry but my skin stayed soft; some of the stronger formulations can do a number on your underarm skin so I was definitely happy that didn't happen. 5. Keep makeup fresh and basic. Sometimes the idea of wearing makeup in the heat can feel unbearable, and wearing creamy, heavy product is certainly a recipe for disaster. I swear by an easy, five-minute routine in the heat. I use tinted moisturizer (with sunscreen! ), a bit of concealer (under eye area and unfortunate adult stress-related red spots of karmic injustice), a touch of translucent powder to set it, a bit of neutral blush, my one true love mascara, and lip gloss. And that's all she wrote. I avoid cream formulas of any sort, shimmery or sparkly things, and dark eyeliner or shadow that will be more obvious if smeared. 6. Blot it up. Pick up some oil-blotting papers at the store and stick 'em in your purse and your car. Use them as a remedy for the mid-afternoon greasies. Avoid using powder to absorb excess oil because it can end up looking caked on and can settle in fine lines and ruin your healthy spring and summer glow. Are you ready for the heat? Do you have any skin tips to share? As part of the DailyBuzz Style Program, I received free Clear Tone Deodorant and a stipend from Dove. However, my opinions are entirely my own. I just love our climate...low humidity..but these are very wonderful tips! Brown sugar. I use it as an exfoliator two or three times a week in the summer and it makes my skin magically soft and supple. 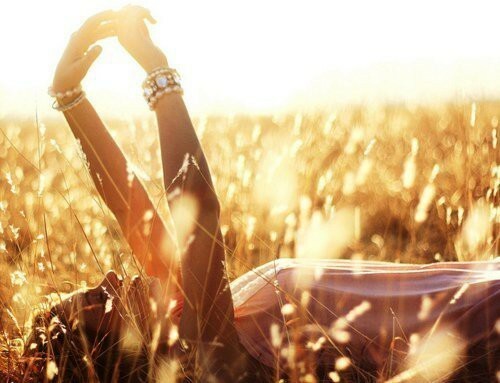 No extra chemicals, as in sugar scrubs from stores--just plain, simple, brown sugar.